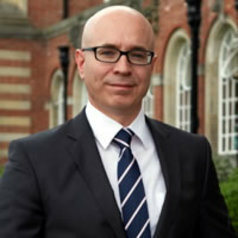 Professor Page has worked in education since 2000. He began his career as a lecturer of English in further education and he was also a manager in a number of subject areas including humanities, finance and construction. While in FE, Professor Page focused on the development of e-learning, working as a consultant for the Learning and Skills Network, creating the Academy of e-Business and winning the JISC e-Learning Practitioner Award in 2005. After six year in FE, he was appointed as Curriculum and Learning Manager for Linking London Lifelong Learning at Birkbeck, University of London, one of the largest lifelong learning networks in the country, forging links between further education colleges and universities. As Dean, Professor Page is responsible for the leadership of all education, childhood and social innovation courses within the School as well as our research and enterprise activity. He also leads on a number of key projects including the Carnegie Multi Academy Trust, the collaboration with Lloyds Banking Group, the Microsoft Initial Teacher Education Partnership and the Leeds Creative Digital University Technical College proposal.